Come on up! Fist's Elimination Tower is a platformer wherein a bunch of randomly generated contestants try to make their way through an obstacle course full of robot bunnies, electrocutions, and giant fists that spring out of the wall. It's available now on Steam and itch.io! RE: Necessary to remove off-screen FlxSprite instances? RE: How to use hexagon Tiled map? But I digress. Is there some way I can get past this sticking point in the compilation? Update: it's not freezing, just taking a while. Between prioritizing the cl.exe process and good ol' fashioned patience, I've been able to compile. Is SteamWrap still a thing? Is this the right way to incorporate the API? I wasn't sure, since it was last updated about 4 years ago - I wanted to make sure there wasn't some other preferred way to do it before tangling myself up in that. Thanks - looks like matrices are going to be the best shot I have at this. I used the version of it on the HaxeFlixel tutorial, and it's running pretty smoothly. To get better control of the palette, I changed the spritesheet palettes from shades of gray to #F00, #0F0, and #00F, so that I can change them to anything I want. The black/dark gray stays more or less the same, but I can invert the matrix to make it lighter if I want, so this will suffice for now. 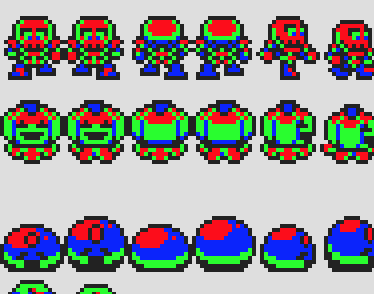 I've done something like that by adding a single-color sprite and setting the blending mode to multiply, but ideally, I'd like to have a more robust palette than light red/red/dark red/black.